Downhill shots out of the rough are a very challenging shot in the short game. They don't know how to play them. There's a specific technique that you want to use. It's going to really help you get out, up and down when you hit a shot and you short side yourself and you have a really hard time getting the ball to stop quickly. What happens nine times out of ten, is that the club face gets hung up in the rough and gets shut down. You take all the loft off the golf club, it launches across the green and you're in big trouble. There's a specific short game technique that I'm going to show you now that's going to help you with this shot. There's a few different things you've got to know. The first one I'm going to show you is how to set up with the club face in your golf grip. Before we get into the ball position and all of those things. Like I'm going to show you next. We're going to get the club face and the grip set up perfectly correct. So the first thing you want to do is you want to weaken your left hand grip. This is important because what you want to do is you want to be able to hold off the release of the club face and not give the club face to shut down and be able to hold it firm enough that you can hold it through the thickness of the rough and the rough won't shut it down as well. This will also give you the added benefit of having a little extra loft coming through, so you're not worried about launching the ball off the green because the down hill slope's always going to make the loft stronger than it normally is. It's going to make it have a tendency to want to launch across the green and obviously because we're short-sided here, we want to hit a short, delicate shot. So we want to have as much loft on there as we can. So of course, I'm using my 62 degree wedge. So, what I'm going to do first, I'm going to put my left hand grip on just my normal grip. I'm going to weaken it and then I'm going to weaken the right hand to match. This is going to allow me to be aggressive and hold a firm, flat left wrist, while holding the club face open through the hitting area, so I'm not worried about de-lofting the club. Okay. The second thing is I'm going to hold the golf club face open, just like I would in a golf sand shot. As you can see, I'm not going to square the club face. That's going to take loft off. I want a lot of loft, again because the down hill slope. So what I'm going to do with the club face open and my weaker grip is then move the ball back about 2/3 of the way back in my stance. This is where a lot of people go wrong. They play it kind of where their normal ball position would be. They get way on their front foot. That's going to make them have a very steep angle of attack, that's going to cause the club face to lose loft and so then they're also going to get the club dragging through the grass too long. The reason I moved the ball back I my stance is for two things, one, I want to make sure I get the balls relatively clean as I can. So I do want a steep angle of attack, but I don't want to get a lot of grass between the club face and the ball. So when I moved the ball back in my golf setup, it allows me to make sure that I'm not going to go right underneath the ball. That's a big fear when you have this much loft on there, is that you just slip the blade right under the ball. The ball sits there and it gets just buried under a worst lie. Moving it back is going to allow me to have a steep angle of attack and get a lot of ball, before the club face starts interacting too much with the grass. Once I've got these three things set up, weaker grip, open club face, ball back 2/3 of my stance, then I've just got to worry about this stroke, and my swing's not going to be much different than normal, except I'm not going to have a lot of body turns. It's going to be a very wristy, handsy stroke going back because I want to pick the club up to get it up off the grass and I allow me to have a lot of wrist angle, coming down, so that I have some power to get the club through the thick grass. The last thing I'm going to do, is I'm going to hold off the release of the club face. This is a key to the short game. I mentioned that earlier with the grip, is as I come through I'm going to hold the club face open, so that it doesn't flip over on me and launch the ball across the green. Again I wanted to maintain the loft as I come through. So let's take a look what this is going to look like. About 2/3 of the way back in my stance, stance is open to the target. It's about 35 degrees or so, roughly. That's a comfort thing. Club face open, laying back, weaker grip, and then as I go back I'm going to pick the club up relatively sharply and then come down and hold off the release of the club. That ball comes out very nice and soft, even though I'm on a pretty severe down hill lie. The ball came out really nice and gentle and I've got a good shot at making ... getting up and down for par. So again, just work on your setup. One thing I didn't mention there was your spine angle. Typically you're going to want to try and match your spine with this slope. Because I'm playing this ball back in my stance, I'm not going to get it that severe. So you'll notice that when the ball is back, my spine angle is not exactly matching the slope. That may be contrary to what you hear a lot, but again, because the ball position and the way I'm holding off the release of the club, and because I'm moving it back in my stance, I don't want to be this far forward again. I'm trying to maintain loft. If I get really steep on it, I'm going to come down even steeper, with a more steep angle of attack and that's going to take more loft off. So those are the keys to hitting a perfect short-sided, down hill shot, out of the rough and a better golf short game. 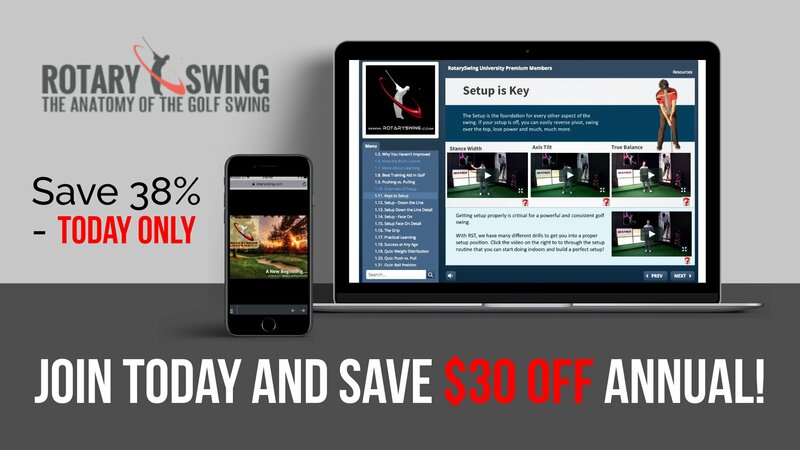 Get Your Free Membership to Finish Watching "The Short Game - Downhill Pitch Shots from Rough" Right Now!